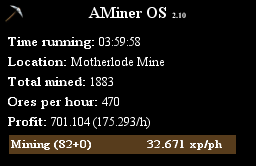 Complete mining script. Mine anything, anywhere, your way. This script contains advanced antipatterns to provide fast and as safe as possible leveling. Sick will be testing right now. 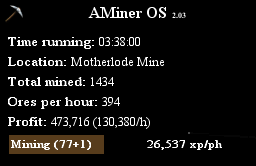 Hey so I used for about...5-8 hours, when im minning iron ore and the ore is mined and the bot is waiting for it to spawn again it clicks the empty rock a lot before it comes again. Banking is good, only used in Alkahrid so far. 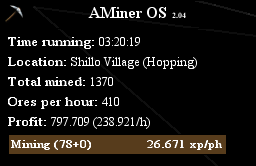 Got about 2.5k iron ores. Thank for posting, testing right now. Mining a spot with 3 iron ores around me. Sometimes runs to the coal 3 spaces away then it corrects itself. Also sometimes misses clicking the ore by a tiny space, making the character run back and forth. 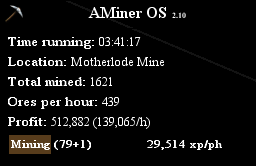 Also mines depleted ore sometimes as well. - The script should no longer try to mine empty rocks. Should be fixed now, thanks for reporting. just wondering does it drop clue geode (clue scroll ) or keeps it since i haven't received a clue yet. If you're powermining it will drop them. Otherwise it keeps them. Can you post scripts log when you select to use Dragon pickaxe special? 1944 The script will automatically stop after 4 hours. VIP subscribers and Premium scripts have no time limits. 1944 [CompressedGraph] Parsed 6951 nodes in 1543ms! Thanks, that looks like a client issue and I'll make a fix for it. For now, try manually opening the combat tab and see if it helps. I'll start working on it as soon as the client updates (there was a game update). There was a game update and the client is automatically updating so just wait a couple of hours. great script i make atleast 1m a day off this! Just giving a heads up when ever i i select mithril and coal ore to be mined in lumbridge west the script crashes after 2 seconds and sometimes when running coal at lumbridge west it stops my character halfway when running back to the mine location from the bank and stands there. Your script is really good, 1 problem i noticed is that sometimes it right clicks and the "walk here" appears, then it tries to mine the rock but the "walk here" option is covering the rock and it isnt able to do anything just hovers over the option. Please post scripts log after it crashes for you at Lumbridge West location, I'm unable to reproduce it. The same goes for the walking issue. The script should automatically close the menu. Does that not happen and it gets stuck until you manually close it? - Fixed Dragon pickaxe special attacks. I do have to manually move the mouse so its not stuck on this, its not a menu but its right clicking options of a certain area, either to pick up or an npc and its stuck on this.